Students and teachers around the nation walked out of class to raise awareness about gun violence in schools in honor of the 17 victims of the Marjory Stoneman Douglas High School massacre on Feb. 14. Students and teachers across the country walked out of schools and universities as part of the #Enough National School Walkout to protest Congress’s inaction in response to gun violence in schools. Walkouts lasted at least 17 minutes in many regions, in honor of the 17 victims of the shooting at Marjory Stoneman Douglas High School in Florida, which took place exactly one month ago, on Feb. 14. The initiative was organized by teen activists of the Women’s March Youth Empower group, who are demanding Congress pass stronger gun control laws. They said nearly 1 million people participated in the nationwide walkouts. While many schools sanctioned the walkout, some school districts threatened disciplinary action, including suspensions, against students who participate. Many of those students, however, walked out anyway — some in groups, some individually. In one school that wouldn't let students walk out, they took a knee in the hallway. Many placed empty desks and podiums outside their schools to honor the lives lost at Parkland. BuzzFeed News reporters covered walkouts in New York City; Washington, DC; Los Angeles; San Francisco; Boise, Idaho; Nevada; Wichita, Kansas; and Austin. BuzzFeed News was live in two segments, in the eastern part of the US and then in the western part. Nearly 1 million students participated in walkouts across the US on Wednesday, according to the Women's March, which helped organizers coordinate and plan the events. More than 3,000 schools were officially registered through Women’s March Youth Empower Action Network page, the organization added. Many students also hosted voter registration drives in coordination with the walkouts. A report of a shooting on the campus of Northwestern University in Evanston, Illinois, prompted a major police response and lockdown just hours after thousands of people walked out of schools across the country to protest gun violence, though investigators later determined the report was "a hoax and a swatting incident." Evanston Police Commander Ryan Glew said at a news conference that the incident began when someone called claiming they had shot their girlfriend. The report sent numerous officers pouring onto the campus around 2:30 p.m., and the university advised people to shelter in place. But less than two hours later, Glew said investigators had located the alleged victim and discovered that she was alive and safe. Police then determined the call was "a hoax and a swatting incident," Glew said, referring to the practice of making a false police report in the hope of sparking an armed response. But the reports of a potential shooter still rattled nerves of people in the area just hours after thousands of students across the country walked out of classes. During the lockdown, people on the campus shared screenshots of the emergency alerts they received, as well as images of police snipers and doors barricaded with furniture. Hope Rehak, a 28-year-old alum and employee of the university, spoke with BuzzFeed News from the campus. She said that it was her first time facing gun violence and added, "I’ve never felt afraid for my life like today." "I’m still in lockdown," Rehak said. "I'm scared and angry but mostly feeling overwhelmed with love." Deborah Copaken tweeted an image from her daughter Sasha, who was on campus and sheltering in a classroom. When asked how she was responding to the situation, Copaken told BuzzFeed News that she didn't "even know how to answer that question right now." "This has got to stop," Copaken said. Boston area students march to the Statehouse in Boston. Schools in Boston were shut down Wednesday because of the snow, but students still walked out into the cold to demand lawmakers take action on gun violence in schools. Many of the students gathered at the historic St. Paul's Cathedral, where students were being taught how to advocate for gun control legislation with their state and federal representatives, WBUR station reported. It was one of thousands of walkouts organized across the country after 17 people were killed in a mass shooting at Marjory Stoneman Douglas High School on Feb. 14. They then walked toward the Massachusetts state legislature. Local news crews captured large crowds of students, trudging on the snowy streets. A notice on the Boston Public Schools website told students and parents that all schools would be closed and no buses would be running because of ongoing snow removal efforts after a snow storm. "Today is just so empowering to have students all across the country coming together to stand in solidarity with Parkland and to really fight for these comprehensive gun control laws," Amamlia Hochman, a sophomore at Somerville High School told CBS local affiliate WBZ. Two students who survived the Las Vegas shooting massacre in October 2017 participated in their school's walkout on Wednesday, addressing their classmates to demand change. Tyler Hamilton, 17, was in the front row of a concert at the outdoor music festival in Las Vegas when a shooter opened fire, killing 58 people. He was not injured, but his best friend was shot in the back. As a student at Advanced Technologies Academy in downtown Las Vegas, Hamilton walked out with his classmates, saying change needs to happen now. Hamilton later told BuzzFeed News he's against banning all guns, but is in favor of longer background checks that include mental evaluations. 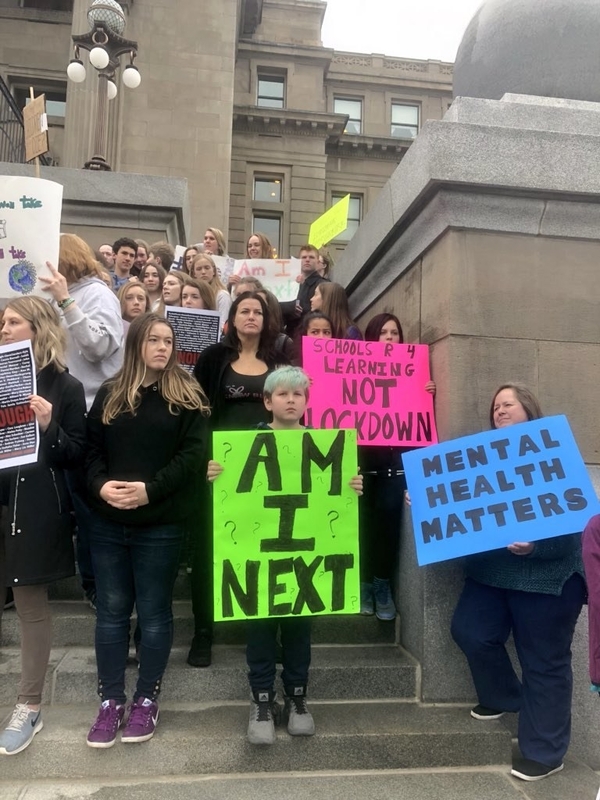 The 17-year-old junior said he's still learning to cope with the trauma he experienced, adding that a "mass shooting affects your everyday life." "School shootings are a reoccurring problem," Hamilton told BuzzFeed News. "As a nation we have to stand up." Students at Advanced Technologies Academy who walked out were told that district police states students who walk out of school will be marked down as absent. Another student who survived the Vegas shooting last year, Marianna Grayer, slammed the school for not being on board with the walkout. "No disrespect to the administration, but I feel like they were trying to hold us back," she said. "I would like to say, we spend the majority of our life in the school and they felt the need to stop us from [walking out.]" At Hamilton High School in Los Angeles, students walked out to take part in the national protest despite warnings they would be disciplined. In one powerful speech, student Miriam Schweiger spoke about being "terrified" their school would be next, and described how her neck hurts from craning around in "six different classrooms" for places she can hide during each of her six different classes, in the case of a shooter. Schweiger also made a joke about failing calculus, which her classmates appreciated. "It’s not right that acquiring a gun is easier than passing calculus, and though I’m not doing either right now, one is ending lives while the other is just disappointing Ms. Alvarez," she said. "It’s not right that when the wind blows open the door to my government classroom, I’m terrified it will be holding a gun. It’s not right that my neck is sore from being craned to look for six different places I can hide in six different classrooms for each of my six periods. It’s not right that keeping people alive has become a partisan issue and that when I think of the Republican party, I think of red, and not because it’s their official color, but because of the millions of blood-stained dollars its leaders accept annually from the NRA. It’s not right that Americans only started giving a damn about gun violence now because it’s mostly white kids leading this movement. It’s not right that acquiring a gun is easier than passing calculus, and though I’m not doing either right now, one is ending lives while the other is just disappointing Ms. Alvarez. It’s not right that the NRA has canned lessons for preschoolers on how to stay safe in the case of an active shooter but hasn’t been able to recognize that maybe those wouldn’t be necessary if it weren’t for the majority of their services. "It’s not right that the Second Amendment is touted as a core aspect of this America’s founding when really this country was built on the 'necessary and proper' clause of the Constitution. It is necessary and proper to regulate guns. It is necessary and proper to replace obsolete legislation. It is necessary and proper to fight like hell for others and make sure that Hamilton High School is not part of the next 'thoughts and prayers,' because this much loss of innocent life isn’t normal, and it most definitely is not right. "So I am begging you, call your representatives, educate your family and friends, and take to the streets, so the next time the wind blows open the door to my government classroom, my breath won’t catch on its un-oiled hinges." Students at Ruth Asawa School of the Arts in San Francisco honored Parkland students on Wednesday with the support of the city's mayor, who was in attendance. “We are demanding all forms of gun control today," one protester said. A student choir also performed. Hundreds of Columbine High School students protested near Denver, nearly 19 years after their school was the site of a deadly shooting that left 12 students and one teacher dead. Another national school walkout has been scheduled for April 20 to commemorate the 19th anniversary of the Columbine shooting. The students released red, white, and blue balloons to honor the 17 victims of the Parkland school shooting. A sign from one of the Columbine High School students read "Enough is enough." Students from high schools, middle schools, and even elementary schools came strapped with powerful messages to push for stricter gun laws. "Fear has no place in school," "Enough," "g(un)safe," some of their signs read. Others had deeply personal and gut-wrenching messages to the public and to Congress: "Will I make it to graduation?" "I miss feeling safe at school." "Am I next?" 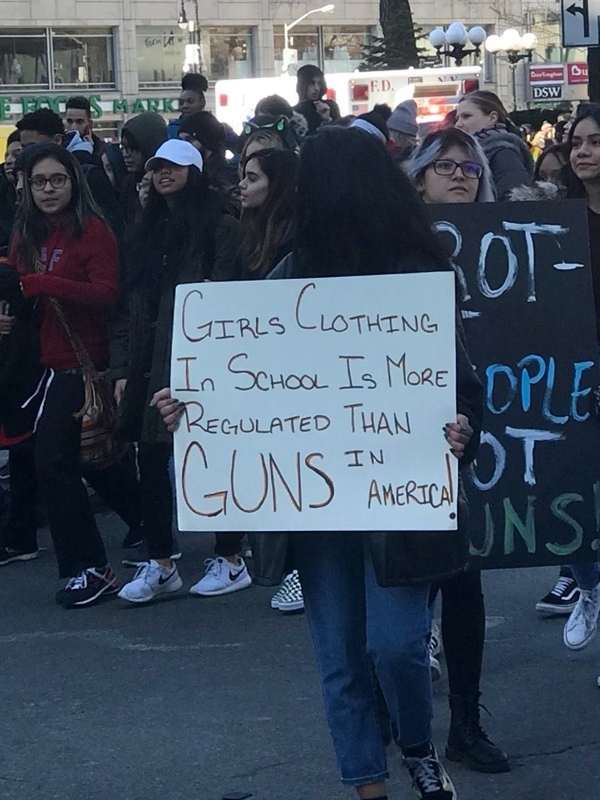 Here are 21 of the most poignant and emotional signs from the national student walkout. All Viacom channels stopped airing their broadcasts and went dark at 10 a.m. ET for 17 minutes on Wednesday morning to honor Parkland school shooting victims. The blackout, which was also in solidarity with protesters who walked out of high schools nationwide, included Nickelodeon, Comedy Central, VH-1, MTV, BET, Logo, and TV Land. “This generation continues to be the driving force for change,” Marva Smalls, Viacom executive vice president of global inclusion, said in a statement. “We believe it’s critical to support the inspiring efforts of our youth, who are literally fighting for their lives," Smalls said. Two students said they walked out of their high schools on Wednesday even though none of their other classmates joined them. Rosa Rodriquez, a sophomore at Sayreville War Memorial High School, honored Parkland school shooting victims and protested gun control by herself while the rest of her high school gathered instead in an assembly. She said her school had threatened to suspend students who participated in the walkout. "If you were gonna come outside in the first place, you should have still came outside," Rodriquez told 1010 Wins. "Just because you didn't want to have these consequences and stuff, just stay inside, you should have came outside and proven them wrong." Another student, Justin Blackman of North Carolina, tweeted a video of himself with the #NationalWalkOut hashtag, saying, "Wow I’m literally the only one." "It's National Walkout day, I'm literally the only one in my school out here," Blackman said while standing near an empty parking lot in Greensboro. "I'm in Spanish class right now. He let me walk out, he didn't really care. Just gonna be chillin' here for the next 15 minutes." Students from Boise High and South Middle School walked out of classes on Wednesday to join others around the country also protesting gun violence. “A lot of people don’t think much of Idaho. But we’re people and our voices matter. Our teachers said this is our right to practice civil disobedience," Lily, a sophomore at the high school, told BuzzFeed News. The students had messages of solidarity for the survivors of the Parkland, Florida, high school shooting. "We support the Parkland students turning their pain into advocacy," said Natalie, a junior at Boise High. “Black Lives Matter has been advocating for gun control for years," said Monique, a student addressing the crowd gathered outside the capitol. “If teachers were to have guns in the classroom, we and other students of color would be more likely to be victims of violence." A man with a Confederate flag arrived at the march at one point, to which a student speaking to the crowd said, “This is a free speech opportunity — ignore him." Sen. Bernie Sanders appeared in Washington, DC, to show solidarity with protesting students, who promptly abandoned the speakers at the podium to mob the former presidential candidate. Teens screamed and chanted his name, trying to take photographs, and several yelled at people in the crowd to "clear a path" and move aside so he could get to the stage. During his 2016 campaign, Sanders shifted from a centrist position on gun control more toward the progressive left, where he has since remained. As the senator walked away, one student repeated, "I shook his hand, I shook his hand." "I'm selling this glove," he said. Students at Wichita's East High School in Kansas walked out for 17 minutes on Wednesday despite threats from school administrators that they would be marked tardy or receive an unexcused absence on their records for protesting. "I’m risking to take an unexcused absence over another life being lost," sophomore Amaan Syed told BuzzFeed News. The school board told students they would support a lunchtime march, but not a morning walk out like other schools across the US on Wednesday. "They kind of released this statement, like, Oh we stand with you, we are in solidarity, but you can't do this,' essentially," Maitri Ajmera, another sophomore at the school, told BuzzFeed News. She added that some students thought the protest wasn't worth getting into trouble for, but many who did walk out felt differently. "I think especially for me, and with all the students saying that protesting isn’t worth being in trouble, the reality is, how passionate do you feel about this cause?" Maitri said. "And I think the reason that all of us are out here is that we are willing to maybe take an unexcused absence." Students around the nation walked out of their schools in honor of the Parkland shooting victims and to raise awareness of gun violence in the US. Students at a high school in Atlanta took a knee for 17 seconds to honor the 17 victims of the Parkland school shooting. According to a Guardian reporter at the protest, 50 to 100 students per floor kneeled at Booker T. Washington High School as part of the national school walkout. According to the Guardian reporter, the administrators had put the school on "lockdown," warning students that they would be "severely punished" for going outside to protest. Kneeling or "taking a knee" has become a potent symbol of protest since NFL players began using it during the national anthem to protest police brutality. To recognize those who died at Stoneman Douglas High School, faculty and students have placed empty desks outside across the country. Some are also placing podiums to recognize the adults killed in Parkland, Florida. Brooklyn students explain why they walked out in protest of gun violence: "It's personal to us"
Students from Saint Ann's, a private school in Brooklyn, New York, were among those who walked out of their schools in protest of gun violence on Wednesday morning. "For us when we’re sitting in class and the fire alarm goes off or there’s a loud honk outside, the first thing we think is, Is this going to wind up on the news in 20 minutes?" student Violet Kopp told BuzzFeed News outside Brooklyn Borough Hall, where protesters gathered. "And that fear that we have while going to school, something that no one should have to think about — that’s why we’re here. Because it’s personal to us." Students at the Parkland, Florida, school where a deadly mass shooting one month ago has prompted a wave of anti-gun protest nationwide, say lawmakers have failed to take action to prevent future tragedies. Alexa was joined by classmates Abby Rose, Nicolle Martin, Raquel Alvarado, and Madison Micioni, as well as Laurie Alhadeff, whose daughter Alyssa died in the Feb. 14 shooting. “These types of laws [would] just make sure your kids are going to go to school and feel safe,” Nicolle said. “I just think that’s all there is to it. We want to go to school knowing we’re going to come back home. These laws should be passed." The students said the support they’ve received from the public has made the past month “a lot easier,” but it has still been difficult. Parents of children participating in the national school walkout against guns shared mixed feelings about the demonstrations on Wednesday. Asked my girl a few days ago if she was going to participate in #NationalWalkoutDay. “I’m one of the organizers, Mom,” she said. I quickly looked away, so she wouldn’t see my tears of pride. You kids will change the world. Some expressed pride over their children's participation in the walkouts. Parents said they felt proud and sad while watching elementary school protesters lying on the ground in silence as part of the walkout. I asked the parents watching what it was like to see their kids all fall to the ground in silence. Very emotional, they told me. They were so proud of them, and so, so sad. Some said they would not give up fighting on behalf of their own kids and all the other children walking out to end gun violence in schools. A mother of two children ages 5 and 3 said she supported their participation in their preschool's walkout. My children and their school are participating in #NationalWalkoutDay. I stand with them. Two weeks before #ParklandSchoolShooting, they did an active shooter drill. My heart breaks learning of their reality. My kids are 5yrs old and 3. Theirs is a preschool. But others shared why their children did not support the movement. "School is for learning Math and Science, not how to protest," one parent, whose son was staying in class today, said. #NationalWalkoutDay As bad as I feel for victims and families of Fla. Shootimg, my HS junior son will be staying in class today. School is for learning Math and Science, not how to protest. Do it on a Sat. Or after school. Write your congressman. Half the kids horseplay for it. One woman said that she was thankful that her grandson's private Christian school sent a letter home telling parents that if their kids wanted to participate in the walkout "then they should consider public schooling." Students at East High School in Wichita, Kansas, walked out in protest of gun violence on Wednesday morning despite their school administration telling them they will be marked tardy for their 17-minute walkout. They read the names and biographies of the 17 victims of the Parkland school shooting, and held a moment of silence for each victim. "The fact that so many of you are out there right now you don't know how close I am to crying right now," said the student organizer reading victims' names. "We've had enough. We're here." Arielle Geismar, 16, a junior at Beacon High School in Manhattan, said she was a co-organizer of her school's walkout. "The aim here was to honor those at Parkland and to tell the policy makers that have been sitting in their seats for way too long not taking any real legislative action...we've had enough, we're here," she said. Students at Manhattan's Beacon High School walked out of school on Wednesday morning for 17 minutes to protest gun violence, in honor of the 17 victims of the Parkland High School shooting in Florida one month ago. They read the names and biographies of each of the Parkland victims, and demanded gun control from legislators. "We will not stop fighting for you. It is the policy makers that have remained silent. Prepare yourselves. We will continue to fight until you act ... We will be the generation to end gun violence," Arielle Geismar, a junior at the school, said in front of the crowd of hundreds of students. Students chanted, "Enough is enough" and "The NRA has got to go" as they demonstrated outside their school. Teens told BuzzFeed News school officials were supportive of their walkout on Wednesday. Elementary school students from PS 51 Elias Howe also lined up across the street and linked arms during the protest. In Brooklyn, students from at least four schools walked out and protested in front of Borough Hall on Wednesday morning. CORRECTION: An earlier version of the post misstated the name of Public School 51 Elias Howe. The names of the 17 victims of the Parkland shooting were also read in Brooklyn. The names of the 17 Parkland victims are being read out followed by a moment of silence. A young girl is passing out these pins in Brooklyn. Brooklyn Borough President Eric Adams addressed the students gathered at Borough Hall. "This is your civil rights moment," he said. Democrats took to the Senate floor Wednesday morning to show solidarity with the students walking out of their classrooms. In addition to reading the names of the Parkland victims, Democrats read the names of other victims of gun violence in their home states. Following Schumer, Sen. Chris Murphy of Connecticut read the names of the victims of the shooting at Sandy Hook Elementary School in 2012. Murphy then talked about his own young son, who has gone through school shooting trainings at school. “My 6-year-old shouldn’t be locked inside a bathroom, smushed together with 24 of his classmates, preparing for the day when a shooter potentially walks into his public elementary school. We have a duty to act,” he said. Sen. Richard Blumenthal, also of Connecticut, praised the students participating in the walkout for giving members of Congress “a real-life lesson” in civics, saying that while the reason for the rallies across the US is “tragic,” it is also “a proud and wonderful moment” to see children pushing for change. The other Democrats who spoke and read names of children killed by guns in their own states were Sens. Catherine Cortez Masto of Nevada, Patty Murray of Washington, Ben Cardin of Maryland, Bernie Sanders of Vermont, Chris Van Hollen of Maryland, and Amy Klobuchar of Minnesota. Student protesters in Washington, DC, chanted "We want change" in front of the White House as students and teachers walked out of schools across the country to honor the Parkland school shooting victims and bring awareness to gun violence in the US. Birmingham City Schools will take an extra minute during today's nationwide school walkout to honor Courtlin Arrington who was killed in an accidental shooting at Huffman High School last week. Michael Jerome Barber, 17, was charged with manslaughter and illegally possessing a firearm for the alleged accidental shooting that killed his 17-year-old classmate on campus. In addition to Birmingham City Schools, students at an elementary school in Alexandria, Virginia also said they would add an extra minute for Arrington. Others on Twitter urged people to also remember Arrington today. Students and teachers across the country are planning to walk out of schools for 17 minutes today. Here’s what to expect. Hundreds of students, teachers, and administrators are expected to walk out of schools and colleges today starting 10 a.m. ET to protest Congress’s inaction in response to gun violence in schools and to demand stronger gun control laws. The #Enough National School Walkout takes place on the one-month anniversary of the shooting at Marjory Stoneman Douglas High School, in which a 19-year-old man killed 17 people using a legally bought firearm. The 17-minute walkout is in honor of the 17 victims of the school shooting. More than 2,800 walkouts are planned across the country, according to the Women’s March Youth Empower group, which organized the protest. “We are walking out for ALL people who have experienced gun violence, including systemic forms of gun violence that disproportionately impact teens in Black and Brown communities,” the organizers said on their website. The teenage activists of Empower are demanding Congress to declare gun violence a public health crisis and to pass stronger gun control laws including banning assault weapons and expanding background checks. Some students plan to circle their school holding hands, and others plan to congregate in hallways to hold hands, sing songs, or stand in silence, the event’s website said. Some will speak the names of the people killed by gun violence. The organizers have suggested that the walkouts be limited to the school’s students and staff. Others are encouraged to show solidarity with the walkouts by wearing orange or walking out of their workplaces to stand with others for 17 minutes. While many schools have allowed their students to participate in the walkouts, some others have threatened disciplinary action, including suspensions, for those who walk out. According to the American Civil Liberties Uion, schools can discipline students for missing a class, but cannot discipline them more harshly than they normally would specifically for expressing a political view or supporting the views behind a protest. Another national school walkout is slated for April 20 to commemorate the 19th anniversary of the Columbine school shooting. And on March 24, the #March4OurLives demonstration, organized by the Parkland school shooting survivors, will take place in Washington, DC. Emma González, a Parkland school shooting survivor whose impassioned plea at a gun control protest went viral, has since become one of the most recognizable faces of Never Again — the teen-led movement to end gun violence in schools. Read Remy Smidt’s profile on the now-famous high school senior spearheading a national movement. A mom, a dad, two little brothers, a soccer team, a desk, a box of nail polish, cleats, a silver dress she wore on her bat mitzvah: These are some of the things the 14-year-old girl left behind when she was killed on Valentine’s Day.